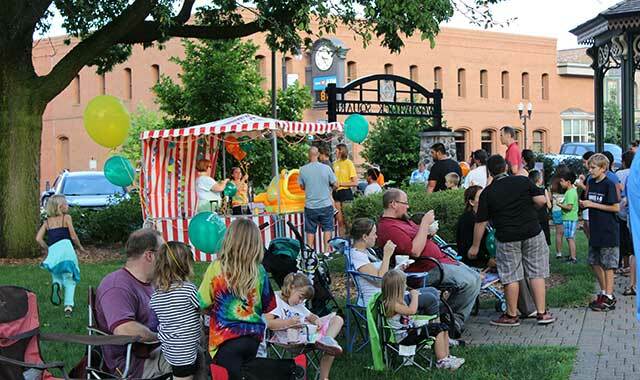 Gather with family and friends on the Woodstock Square for events like the Harry Potter-themed Wizarding World on Aug. 9 and a car show on Aug. 18. Through Aug. 16, Thu. 5-8 p.m. Family-friendly entertainment with music and more. Morton Arboretum, 4100 Ill. Rt. 53, Lisle, (630) 968-0074, mortonarb.org. Through Aug. 29, Wed. 5-7:45 p.m. Enjoy a leisurely evening of music and dancing, lawn games, refreshing beverages and delicious tapas. Outside food and drink (except alcohol) allowed. Morton Arboretum, Lisle, (630) 968-0074, mortonarb.org. Through Aug. 31, Thu. 6:30 p.m. Themes include convertibles; red, white and blue cars; Corvettes and cars from the ’50s, ’60s, and ‘70s. Features local food vendors, entertainment, kids’ activities, raffles and prizes. All vehicles welcome. Parking lot at Cook and Station streets, downtown Barrington, (847) 304-3400, barrington-il.gov. Through Sept., Tue. 5:30-7:30 p.m. Entertainment for the whole family, including kids’ games, inflatables and face painting. Downtown Sycamore, (815) 895-3456, discoversycamore.com. other items from local farmers and producers. Food and beverage vendors. Park Avenue and Cook Street, downtown Barrington, barringtonfarmersmarket.com. Through October, Tues. & Sat. 8 a.m.-1 p.m. Shop for fruits and vegetables, flowers, cheese, eggs, pet treats, bakery items, candles, olive oil, pottery and more. Woodstock Square, Woodstock, (815) 338-5164, woodstockfarmersmarket.org. Through Nov. 11, Sun. 9 a.m.-2 p.m. Shoppers find fresh produce, flowers, baked goods, jewelry, handbags and fine French linens. Fourth and South streets, downtown Geneva, (630) 232-7494, geneva.il.us. July 7, 3-7 p.m. More than 40 exclusive, limited-production beers, food and music by classic rock cover band Second Time Around. Proceeds benefit programs for the elderly. Barrington Area Council on Aging (BACOA), downtown Barrington, (847) 381-5030, barringtonbrewfest.com. July 7, 4:30 p.m.-sunset. Cyclists and foodies enjoy vehicle-free roads, live entertainment and a food truck social. Morton Arboretum, Lisle, (630) 968-0074, mortonarb.org. July 11, Aug. 8, 6-9 p.m. Enjoy culinary delights from East Dundee restaurants, a glass of wine or beer, and some local music. The Depot, 319 N. River St., East Dundee, (847) 426-2255, eastdundee.net. July 12-22, events daily. Eleven days of family fun including a parade, carnival, Music Fest, Arts & Crafts in the Park, sidewalk sales, Food Fest, a car show and lots of entertainment. Peterson Park, 4300 Peterson Park Road, McHenry, mchenryfiestadays.com. July 13-14, Fri. 4:30-11 p.m. The annual celebration of Celtic pride; Irish dancing, heritage, food and fun. Arlington Heights Historical Museum, 110 W. Freemont St., Arlington Heights, (847) 255-1225, ahmuseum.org. July 13-15, 8 a.m.-11 p.m. Play on inflatables, compete in a sidewalk chalk drawing contest, participate in a pet parade and golf challenge, sample food, visit the beer garden and listen to music. Batavia Riverwalk, downtown Batavia, (630) 879-5235, bataviaparks.org. July 16, 10 a.m.-3 p.m. Lively music and delicious food; prizes awarded for cars. Proceeds support the museum. Elgin History Museum, 360 Park St., Elgin, (847) 742-4248, elginhistory.org. July 18-22, events daily. Wed. City Band concert and ice cream social; Th. movie in the park; Fri.
climbing wall, carnival and beer garden. Emricson Park, 1313 Kishwaukee Valley Road, Woodstock, (815) 338-4300, mchenryil.gov. July 18-22, Wed.-Thu. 3-11 p.m., Fri.-Sat. noon-midnight, Sun. to 10 p.m. The 150th fair’s offerings include bull riders, barrel racing, a demolition derby, live entertainment, 4-H displays, a car show, petting zoo, rides and racing pigs. Kane County Fairgrounds, 525 Randall Road, St. Charles, (630) 584-6926, kanecountyfair.com. July 24, Aug. 28, Sept. 25, 5-8 p.m. Fun-filled classic/vintage car show. Location: Riverside Avenue, downtown St. Charles. Info: (630) 584-8384, stcharleschamber.com. July 25-29, Wed.-Thu. 10 a.m.-11 p.m., Fri.-Sat. to midnight, Sun. to 7 p.m. Midway games and rides, blue ribbon competitions for quilts, cakes, pickles, flowers, fine arts, photography, textiles, crafts, ceramics, cattle and sheep. Lake County Fairgrounds, 1060 E. Peterson Road, Grayslake, (847) 680-7200, lcfair.com. July 26-29, Th. 4-10 p.m., Fri. 9 a.m.-11 p.m., Sat. 11 a.m.-11 p.m., Sun. to 5 p.m. Fireworks 9 p.m. In its 58th year, this family-friendly event includes music, a cardboard boat regatta, carnival, cat and dog shows, and fireworks. Food offerings include New Orleans cuisine, pizza, BBQ, roast corn and burgers. Spella Park, 2550 Harnish Dr., Algonquin, (847) 658-5340, algonquinfoundersdays.com. July 28, 9 a.m. Life-size cardboard boats race along a 200-yard course for awards such as most creative, stars and stripes, and most spectacular sinking. Rain date July 29. Proceeds support some 20 local charities. Crystal Lake Main Beach, 300 Lakeshore Dr., Crystal Lake, (815) 477-5404, crystallakesparks.org. July 28-29, 10 a.m.-4 p.m. Walk through time visiting military encampments ranging from ancient Rome through Operation Desert Storm; see how soldiers lived and fought, as well as the progression of clothing, weapons and technology. Cantigny Park, 1S151 Winfield Road, Wheaton, (630) 668-5161, cantigny.org. July 31-Aug. 5, Tue. 4-10 p.m., Wed.-Sun. 8 a.m.-10 p.m. In its 69th year, the fair features 4-H livestock shows, conservation and agriculture displays, a carnival and a variety of grandstand entertainment. McHenry County Fairgrounds, 11900 Country Club Road, Woodstock, (815) 338-5313, mchenrycountyfair.com. Aug. 3-5, Fri. 6 p.m. opening event, Sat.-Sun. 10 a.m.-4 p.m. Explore the diverse cultures of Asia through music, dance, food and trees. Fri. evening includes a formal ceremony, performances, food and a Japanese lantern display on Meadow Lake. Morton Arboretum, Lisle, (630) 968-0074, mortonarb.org. Aug. 3-4, Fri. 5-11 p.m., Sat. noon-11 p.m. Stroll downtown, sample food from local vendors and listen to live music. Vail Ave. and Campbell St., Arlington Heights, (847) 253-1703, arlingtonhcc.com. Aug. 4-5, Sept. 1-2, Sat. noon-5 p.m., Sun. 7 a.m.-4 p.m. New collectors and seasoned veterans search for great finds among hundreds of dealers of jewelry, furniture, books, antiques and more. Kane County Fairgrounds, St. Charles, (630) 377-2252, kanecountyfleamarket.com. Aug. 5, 9 a.m.-1 p.m. Antique and collectible tools on display for trading or buying. Garfield Farm Museum, 3N016 Garfield Road, La Fox, (630) 584-8485, garfieldfarm.org. Aug. 5, 10 a.m.-6 p.m. The past comes alive through the display of antique autos, trucks, fire engines, tractors and buses. Ride streetcars, interurban and diesel coach trains. Illinois Railway Museum, 7000 Olson Road, Union, (815) 923-4391, irm.org. Aug. 9, 4-8 p.m. Celebrating 21 years of Harry Potter. Enter adult or child costume contests, take a tour of Gringotts Bank, visit the owlery, watch a live quidditch match and compete in Harry Potter trivia contests. For all ages. Woodstock Square, Woodstock, (815) 338-0542, woodstockpubliclibrary.org. Aug. 12, 10 a.m-4 p.m. Lots of joie de vivre for visitors to this French open-air market, tasting wine, listening to music, playing a game of pétanque and posing beside a 23-foot Eiffel Tower. Cantigny Park, Wheaton, (630) 668-5161, cantigny.org. Aug. 15-19, events daily. Family entertainment includes a craft fair, carnival, water ski show, brat stands and a beer tent, capped off with a lighted boat parade and fireworks display. Entertainment nightly. Lake Geneva Jaycees, Seminary Park, 521 Baker St. & Flat Iron Park, 201 Wrigley Dr., Lake Geneva, venetianfest.com. Aug. 17-19, Fri. 5-11 p.m., Sat. 3-11 p.m., Sun. 11:30 a.m.-6 p.m. Family-friendly blues music fest on McCullom Lake tempts visitors with an array of barbecue foods, corn on the cob and desserts. BBQ Cook-Off competition. McHenry Rotary Club, Peterson Park, 4300 Peterson Park Road, McHenry, (770) 220-9300, mrbbb.com. Aug. 17-20, events daily. Live entertainment, car and craft shows, carnival rides, food and fireworks. Panton Mill Park, 10 N. Water St., South Elgin, (847) 774-1151, riverfestexpress.net. Aug. 18, 11:30 a.m.-12:30 p.m. Hundreds of vintage hot rods and custom cars fill the Woodstock Square Historic District for the 7th annual benefit show. Woodstock Square, Woodstock, (815) 338-4300, woodstockil.gov. Aug. 18-19, 10 a.m.-6 p.m. The charming village is the site of this street market for all things vintage, antique, reclaimed and handmade. Take a hayride, sample street food and enjoy live music. Historic Long Grove Village, 308 Old McHenry Road, Long Grove, (847) 634-0888, longgrove.org. Aug. 26, 10 a.m.-4 p.m. Participants from all over the county display their antique, classic and modern automobiles. Featuring Mercedes Benz SLs, Chryslers, steam-powered cars and a celebration of the 70th anniversary of the Chicago Region/Sports Car Club of America. Benefits LivingWell Cancer Resource Center. Third Street, downtown Geneva, (630) 584-3107, genevaconcours.net. Aug. 31, Sept. 1-2, events daily. Enjoy balloon launches in morning and evening, tethered balloon rides, helicopter rides, bumper boats, inflatables, a rock wall, zip line and live bands. Milky Way Park, 300 Lawrence Road, Harvard, (815) 943-6468, harvardballoonfest.com. Aug. 31, Sept. 1-2, Fri. 3-10:30 p.m., Sat. 9:30 a.m.-10:30 p.m., Sun. 11 a.m.-9:30 p.m. A weekend of fun including a carnival, car show, Kids Korner, talent contest, wine tasting and bands. Sunset Park, 5200 Miller Road, Lake in the Hills, (847) 960-7400, summersunsetfest.com. This entry was posted on Thursday, July 12th, 2018 at 11:58 am	and is filed under Recreation & Destinations. You can follow any responses to this entry through the RSS 2.0 feed. Both comments and pings are currently closed.